This blog is a place for me to chronicle my adventures in reading the Great Books, and share some of what I discover along this journey. With the growing integration of technology in education and life and the emphasis on personalized and competency-based approaches in the classroom, the role of the teacher is changing dramatically. It is no longer enough for us to present information to students and then test them on it with some worksheets or questions from a textbook in between to let students “practice”. Teachers who are actively engaging the changes in the world and classroom in an effort to do what’s best for student learning are discovering that as we do what’s best for students, the traditional role of “teacher” is fading. A reflective lot by nature, educators are struggling to find new ways to describe what we do. Common terms I’ve heard recently are: guide, mentor, and facilitator. Considered “out there” or “pushing the boundaries” by his colleagues and administrators, Mr. Smith saw that his methods of presenting information, assigning homework, and quizzing and testing students on material was not producing high levels of learning for all students. Perhaps his students had changed, perhaps the world had changed, perhaps the state tests had changed; but regardless of the cause, there were students who just didn’t “get it”, and Mr. Smith knew that presenting more of the same wasn’t going to help them. At the same time, Mr. Smith recognized that the world had become information rich, and that students had a plethora of information at their hands. What students needed to learn was how to tell the important information from the unimportant (spot the signal amidst the noise), and then how to assess and think critically about information. Taking a step back, Mr. Smith went to his state standards and developed specific measurable student performance tasks with rubrics that lined up with the standards. Then he grouped these tasks into clusters and looked for applications of these tasks in the world. Mr. Smith began presenting his students with challenges and tasks, and then worked with them and encouraged them to work with each other to solve these challenges and perform tasks that demonstrated their mastery or proficiency in various domains. When students fell short of proficiency in a domain, they were given other opportunities to grow and develop the necessary skills until they got it. Students progressed at different rates, and Mr. Smith had a difficult time fixing a “grade” on his students’ work at a specific time, but his students were actively engaged in the learning experiences he had designed, and often commented that it didn’t feel like “school work”. 1. It’s hard to fit new learning experiences into traditional grading and grade-reporting practices. As I have implemented various forms of competency-based education in my classroom, I have always run up against the wall of having to assign a numerical grade to each student at the end of each quarter. Educational systems need to be open to new ways of reporting and recording student learning: portfolios with artifacts, videos of students doing things, projects with a product that serves as a demonstration of learning. 2. In my sketch, I glossed over the part of the story where Mr. Smith spent his entire summer reading, researching, and designing those awesome learning experiences that engaged his students. I also didn’t mention that he did it all without getting paid more than his colleagues who didn’t spend their summer doing that. Time and money are serious limiting factors for educators. If we truly value student learning and we want teachers to invest their time in designing learning experiences for students, we need to give them the time to do it, and compensate them for their work. 3. I didn’t mention in my sketch what happened when Mr. Smith’s students took the state mandated standardized test at the end of the year. The early evidence from teachers who are adopting these new learning practices seems to indicate that students who learn in this environment actually do better on standardized tests than they would have if they had been taught in a more traditional learning environment. But whether or not this is true, I wonder: how good are state standardized tests at measuring personalized student learning? In some states, teacher compensation is being tied to student scores on state standardized tests, and so it is understandable that teachers would be reluctant to change everything they do when it could impact their salary and job security. 4. Lack of knowledge and training also holds back well-intentioned teachers. Most teachers didn’t learn about cognition, neuro-science, brain-based research, design principles, etc. in their teachers training programs. The skill set required to be a learning-centered teacher is a shift from what was required of traditional teachers. I think colleges are still adjusting to this, and even if every college started turning out new teachers who were trained in these skills tomorrow, the majority of the teachers in the country are not new-hires. Teachers need support and training in how to design engaging student learning experiences. 5. The last reason I want to mention here is fear. Some teachers are afraid of taking risks, of doing something different, of letting different students produce different end products, of how parents, students, colleagues, and administrators will react to what they’re doing. What I’ve put forward here is nothing more than a discussion of a shift from teacher teaching to student learning. For the past one hundred years or so, in the United States, we have had an educational system that put a teaching teacher (i.e. a lecturing teacher) at the center. We fixed curricula (what will be learned and in what order) for our core subjects. We created tests to “measure” students based on these fixed curricula (although I’m not sure exactly what those tests really measure). If we’re going to shift to an educational system focused on student learning, then we will need to give students choices around what they learn, how they learn it, when they learn it, and how and when they demonstrate their mastery of the material. We will also need to support and train teachers through this transition and beyond. A teacher with a growth-mindset who models continual learning for students is an essential piece of a true student-learning centered educational system. And while all of these changes may be scary (to all stakeholders), the alternative of continuing to do what we’ve always done and allow some students to simply not “get it” is even scarier. Over the past five years I have attended hundreds of hours of professional development (PD for short) as a teacher. This includes everything from monthly staff meetings and department meetings to hour-long weekly PD sessions on a variety of topics to “beginning of year PD days” to day-long sessions, and week-long conferences. I even participated in an on-going nine month PD that met for a half-day once each month. And my title for this post sums up my experiences pretty well. If you’re not an educator, there is an expectation in the United States for educators that we continually grow and develop as professionals by expanding our own learning in our content area as well as in the field of education. Most schools start the year with a few “PD Days” that don’t typically involve much development. They usually cover mundane maintenance information. They’re dull days spent sitting listening to other people talk at you about retirement benefits, insurance, emergency procedures, etc. Don’t get me wrong: emergency procedures are important. In fact, they’re so important, it’s probably not a good idea to sandwich them between mind-numbing sessions on insurance and SMSs and LMSs, etc. 1) It’s led by teachers. The best professional development experiences I’ve had have been organized and led by teachers. This is a challenge because teachers are already over-worked and under-paid; so putting on a quality professional development experience for colleagues takes time that teachers often don’t have. Administrators need to identify teacher leaders and find ways to free up their time so they can develop and execute quality PD for their colleagues. Teachers who are “in the trenches” speak to the experience of other educators in a way that “experts” and administrators cannot. 2) It’s practical. When teachers sign up for (or are forced to attend) professional development, they want to walk away from the hour/day/week with something tangible that they can implement in their classrooms to improve student learning. I’m not really interested in sitting through a day-long conference about why I should integrate social justice topics into my classroom. I would much prefer to spend a day walking through actual social justice themed lessons that I can use in my own classroom. I was at a conference in Grand Rapids a couple summers ago, and the presenters treated us like a class and actually did a lesson with us, and then gave us the lesson plan. 3) It’s interactive. I can’t tell you how many times I’ve sat through PD about interactive learning or projected based learning that was delivered as a lecture. Talk about a total disconnect! Setup your PD to reflect what you’re trying to share. If it’s a PD on flipping the classroom, e-mail participants a link to a video you want them to watch the night before. I went to a day-long PD on using the socratic method in classrooms, and the presenter broke us up into groups and ran the whole day like he would run a classroom, constantly modeling the socratic method and how it can be used with students. 4) There are materials (handouts, etc.) available after the presentation, and the presentation itself is recorded and shared (or at least the powerpoint is uploaded). This is especially true at conferences. When I attend 5-6 1-1.5 hour sessions every day for a couple days in a row, it gets to be a bit of an overload, and at the end of the day, it helps to have a website where I can download materials or the presentation itself and re-watch it (even a week or a month later, when I’m thinking “What did that lady say?”). We're looking at Burger and Starbird's The Five Elements of Effective Thinking, chapter 5: Engaging Change. Summary: "Change is the universal constant that allows you to get the most out of living and learning." (p. 8) Change is the one thing we can always count on in this world, and we must all learn to adapt to new things. We can choose to be part of the change or not. We can embrace it or reject it. But it will happen regardless of our choices. Learning to adapt is one of the most useful skills in life. I think this is very key. This was one of Father Chaminade's lessons, and it's one of the Characteristics of a Marianist Education; I was educated by the Marianist brothers, and teach at a Marianist school. When I talk about this kind of growth and change, I often use the word "better", and many people mis-interpret that as "better than other people", and I have to clarify that I mean "better tomorrow than you are today". This isn't about comparing ourselves to others, but rather to ourselves, and setting our own personal goals and advancing toward them. Change is going to happen, regardless of how we feel about it. Like a surfer, we have to learn to ride the crest of the wave, staying on top of the ever advancing curve without crashing. No one gets it right all the time. But the successful surfers get back on their boards and catch another wave. We're looking at Burger and Starbird's The Five Elements of Effective Thinking, chapter 4: Seeing the Flow of Ideas. Summary: Ideas have history and lives of their own. Knowing where ideas came from can help us understand where they're going. Looking back and seeing the past can help us understand where to go in the future. All ideas are interconnected, and understanding those connections help us think more deeply about them. Understanding the interconnectedness of ideas also helps us integrate new learning into our current understanding of the world. I absolutely agree with the fundamental concept here, and I think the insight about how teachers view course material vs. how students view course material in the quote above is valuable to students who can leverage it. Teachers see the big picture and build the complexities out of a solid understanding of the fundamentals; we also see the connections between all the sub-sections, and how they work together to make a whole. This is often the thing that students fail to see, perhaps because they haven't fully grasped each piece, and so it is hard for them to put the pieces together in a whole. Good education gives students perspective, teaches them to see the "big picture", and helps them integrate everything. There is one part of this chapter to which I take some exception. Personally, I'm a bit of a neo-Platonist, and I don't think of ideas as "human" (the way the authors describe them). I think of ideas as ethereal entities on their own out there in idea-land. When an idea passes through our mind, it represents an intersection between our physical reality and the ethereal idea-land where that idea resides. Some would argue that an idea that has never occurred to a human hasn't ever existed, but I prefer to think of it as out there in idea-land, just waiting to be discovered. We're looking at Burger and Starbird's The Five Elements of Effective Thinking, chapter 3: Be Your Own Socrates. Summary: Questions are one of the most powerful tools we have in critical thinking. Questions open us up to possibilities; they expand our horizons; they lead us down new paths. We need to learn how to form quality questions, and to tell more fruitful questions from less fruitful ones. Questions are how we explore ideas. We need to learn to formulate our own questions. A few years ago I went to a professional development day that was all about using the Socratic (questioning) method in the classroom. I didn't completely convert my classroom to this method, but it occurred to me that an authentic learning environment should be more about good questions than a stream of information. Before that day, a lot of my classes had revolved around me disseminating information, and then me generating questions, and my students trying to remember the information and apply it to my questions. This is a pretty standard methodology that is widely applied throughout the American educational system. But, as I reflected upon it, it seemed backwards. Really, the questions should come from a developing dialogue in the classroom; students should have as much input into the questions as I do, and we should be partners in seeking answers to questions, rather than me just spewing information at them. Of course, part of any classroom needs to be instruction. There is always a time and place to demonstrate a technique or to convey a piece of critical information. But, from that point forward, I tried to become much more aware of my questions in the classroom, and to think about the kind of questions I was asking, and to try to use questions in my classroom as a tool to help lead students and to help them build their own understanding of a topic. When I taught Latin, my example was that I would teach students the critical translation questions to ask (Part of speech? Case? Number? Gender? Tense? Voice? Mood? etc.) so that they could learn to ask themselves those questions. Eventually, we got to a point where many students could parse the Latin on their own and craft a respectable translation. Even now, as a math teacher, many students want me to solve their problem for them, and there's certainly a time to give students examples of how to work certain kinds of problems, but just as often, I step back and say, "What do you think? How would you solve this problem? What are your options?" This is much more difficult than just showing the student a solution, but it builds their ability to work at problems, which is more important than solving any particular problem. We're looking at Burger and Starbird's The Five Elements of Effective Thinking, chapter 2: Fail to Succeed. Summary: Mistakes are the pathway to success. Mistakes help us refine our understanding. They help us imagine new possibilities. They help us understand "why". Freeing ourselves to make mistakes also frees us from the fear and constraint of "being wrong", which often stops people from taking critical steps in developing their thinking. Implicit in this element is risk taking, which seems to be a problem for a lot of people. Personally, I have a high risk-tolerance, and, in fact, do not often perceive as "risks" things other people think of as "risks". But I encounter my students (and even adults) who have a visceral fear of anything they perceive as a "risk". Students won't answer a question in front of their peers for fear of "looking stupid". This is one of the hardest preconceived notions to break, because for every time I tell students that it's okay to be wrong, and that being wrong is the first step on the road to understanding, popular culture tells them that being wrong is bad and that it makes them stupid. This element ties in very nicely with Dweck's research on growth vs. fixed mindsets. Growth mindset individuals see failure as an opportunity to try again. They see potential for growth and learning, and so aren't afraid to fail, because they don't see failure as the end, but rather as the path. Fixed mindset individuals are afraid to fail, because they believe that their abilities and intelligence is fixed, and so if they fail once, then they believe they'll fail every time. Somehow, we have to break this fear of failure. We're all going to get it wrong sometimes; that's part of life. If we use that failure to grow and learn, then we're the better for it. Nothing ventured, nothing gained. We're looking at Burger and Starbird's text The Five Elements of Effective Thinking, chapter 1: Understand Deeply. Summary: Advanced ideas are often built on a foundation of other ideas. It's important to understand the fundamentals clearly and deeply. One of the key skills here is stripping away the fluff to get to the core of the idea you're investigating. Don't be satisfied with your current depth of understanding, because you can always go deeper, you can always understand more clearly. Push yourself to increasing your understanding. Not following this principle is one of the most common errors I see in the classroom. I remember one of my Latin professors in college telling us a story about her high school Latin class studying/translating Caesar's campaign against the Gauls, and one of the questions on the final exam was "Who was Vercingetorix?" and none of the students knew that he was the leader of the Gauls whom Caesar captured and brought back to Rome, which marked the end of his campaign. The students had translated Caesar's journals all year, but they got so lost in the intricacies of translation that they lost sight of the bigger historical picture. In my own classroom, I see it happen with concepts like differentiation. Students learn the limit definition of the derivative, and then they learn the Power Rule, the Chain Rule, the Quotient Rule, the Product Rule, etc. And I always start differentiation by showing the tangent line problem and visualizing taking a secant line with a diminishing delta "x" (as this sets up the limit definition nicely) until it becomes a tangent, etc. But still, when I ask: "What does it mean to take the derivative of a function?" I get blank stares, because my students failed to deeply understand the basic concept. I probably did the same as a student. This, to me, is the real difficulty of being a teacher: a good teacher is one who has thought extensively and deeply about the truths and mysteries of her/his subject, and s/he is trying to introduce students to the fundamentals, but students just haven't put in the time to see the beauty of the underlying structure of the subject. And if they don't put in the time, they'll remain forever mired in the quicksand of shallow understanding. Last Spring I attended a lecture by Dr. Edward Burger (president of Southwestern University, and perhaps the most famous math teacher since Pythagoras), and received this book: The Five Elements of Effective Thinking (buy it here on Amazon) by Edward Burger and Michael Starbird. It's a quick read with lots of useful thoughts. It ties in nicely with the "growth mindset" research of Carol Dweck, which I've written about on this blog before (and I recommend you search it up). The five elements in the title correspond to chapters in the book, and so that's how I'll organize my blog posts. Each one will be a post with a summary, some critical quotes, and a little personal commentary. Below are links to my posts for each of the five chapters. One of the themes I started on this blog a while back revolved around Beauty and its importance in the world and in our lives. I picked up a pseudo-random book from the library the other day (The Art of Travel by Alain de Botton). The book was just okay; it didn't contain anything I thought was worth sharing, but it had excellent illustrations that were selected to fit the mood of certain sections of the book. 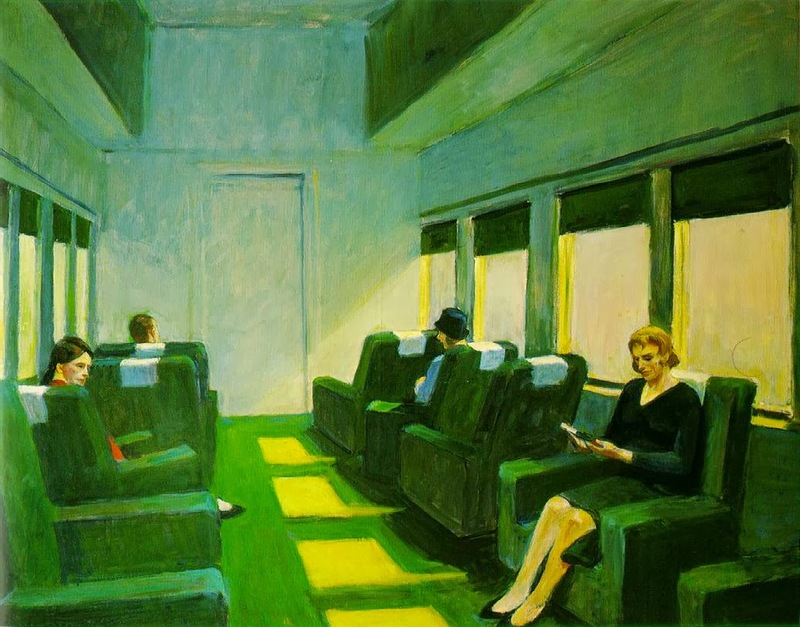 One of the sections used a couple of paintings by Edward Hopper, and I had forgotten how much I enjoy his work and was inspired to share a little bit of it here. So here's to putting a little beauty in your day! 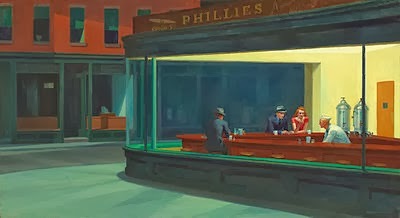 This first selection is probably Hopper's most famous and most "spoofed" work, "Nighthawks". 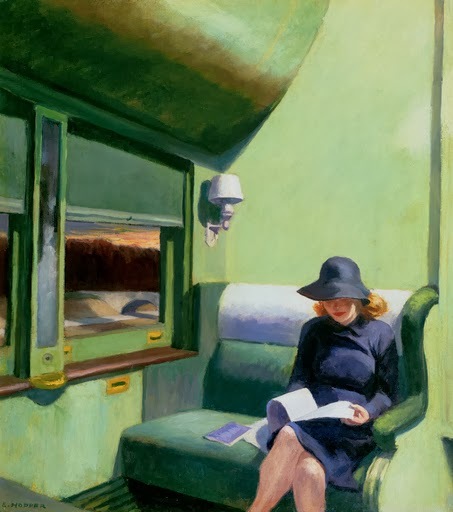 One of the recurring themes of Hopper's work that I enjoy is his exploration of "ordinary" American life. But the painting raises more questions than it answers: Who are these people? Why are they up late? Why are they at a diner? What's the story with the man and the woman in the red dress (because it seems that there must be some kind of story.)? This is called "Apartment 3c". This was one of the pieces used in the book I mentioned above in a section on train travel. I'm not sure why I like this piece so much, but let me take a couple guesses: 1) the dominant color is green; this may seem trivial, but certain colors draw us in and set a certain kind of mood. 2) The young woman depicted is reading, and I love images of people reading, because reading is such a personal thing, it transports us to another place, and we become lost in whatever we read. And the idea of watching someone forget themselves and become engrossed in something is enticing to me. 3) There's a young woman, traveling alone on an overnight train (the sun is setting in the background and she doesn't look like she's getting off soon). What's the story there?! Again, Hopper leaves me with more questions than answers. I'm going to let this one stand without commentary. It caught my eye and I like it. Enough. 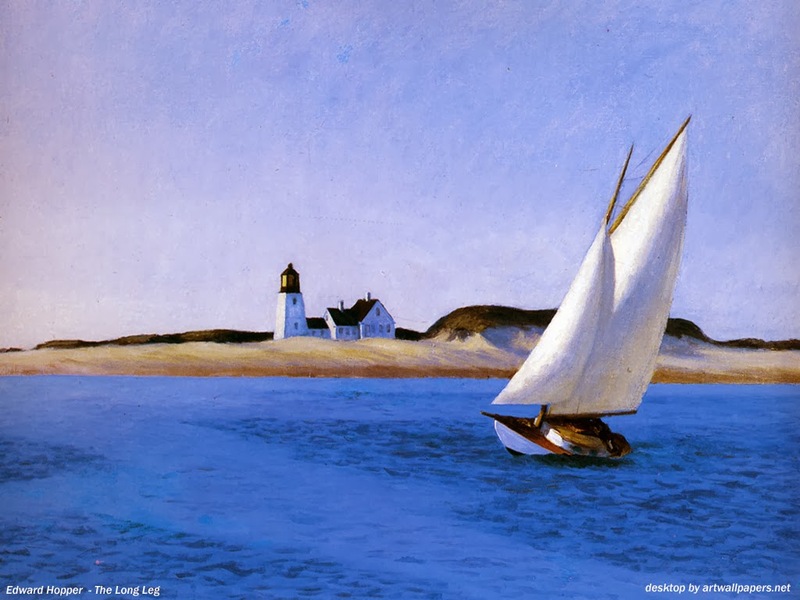 Last, but not least, I thought I'd share one of his landscapes, because, although he's not known for them, Hopper has a way of taking a landscape and bringing it alive, of making me feel like I'm actually there. It's also fun to see him work his magic with a bright blue ocean and bright sea-scape, instead of the interior of a train. It just goes to show his versatility and skill. Anyway, I hope you enjoyed this little share. I'm really going to try hard to update the blog more often. This year has been killer at school, and I just haven't had the kind of time for other pursuits that I used to. Years ago, in college, as my mind was being stretched and shaped by a few key professors, I remember being in conversation with Dr. Wickersham one day. I do not remember specifically what we were talking about, but I finally thought I had put together a solid and intelligent point, and as soon as I "had my footing" in the conversation, Wickersham took the whole thing to another level, examining what we were discussing from a larger perspective. He had cultivated the habit of seeing particular things as specific examples of a larger generalizable order. This habit, I believe, is the most valuable intellectual habit one can acquire in school. I have believed this since that conversation, and my experience as a teacher has only confirmed my original belief. The ability to generalize and see something as part of a larger structure, as part of a pattern, not just an isolated incident, is especially important in math (the subject I teach). I am constantly trying to get my students to see the larger "class" of problems that a specific problem belongs to, because once we learn to solve a few specific examples, we can work out a general solution for all problems of that type. The quadratic equation is a good example of this. There are many variations on the theme of quadratics (2nd degree equations), and many ways to solve certain kinds of quadratics, but the quadratic equation is the general solution to all quadratics. Some students seem naturally good at this skill, whether because of their environment, up-bringing, or personality. Other students have tremendous difficulty with this, even after it has been repeatedly demonstrated and highlighted. What interests me is: what is the most effective way to teach this concept and to get students to apply it on their own? If anyone has any thoughts, feel free to share them in the comments. Also, I apologize for my absence recently; school has been very busy! Thanks to the reader who posted the nice comment about looking forward to my next post! It's always nice to know I'm not shouting into the wind. I'm a classically trained Catholic humanist. I teach Latin. This blog will chronicle my attempt to analytically read 100 of the "Great Books". I'll be sharing insights and favorite quotes as I read through them.